Which Vaccinations Does My Child Need? Click on the thumbnail to download a schedule of childhood vaccinations. Why does my child need a vaccination? Vaccinations are often called “shots” (given as an injection with a needle), but vaccinations can also be given by a liquid or spray in the mouth or nose. Vaccines are the actual medicine that are part of the vaccination process. They help keep your child from getting a serious disease. They protect against many common diseases, like measles, mumps, rubella, polio, hepatitis B, diphtheria, whooping cough (pertussis), tetanus, chickenpox and hemophilus influenza type b (Hib) disease. These are called the "Big 10." Some of these can be very serious. Some may not have a cure. Your child may die from certain diseases if he or she is not protected. Children with these diseases can pass them along and make other children sick, so vaccines also help protect others. For this reason, proof of vaccination is often needed before your child can enter school or childcare. Vaccines help your child’s body “prepare” for a real infection. To do this, vaccines contain parts of a dead or weakened germ. Once the shot is given, your child’s body will make antibodies, which help find and kill these germs. These antibodies will protect your child if they ever come in contact with the real germ. Vaccines are among the safest therapies there are.. They have saved millions of children from serious disease. As with any medication, there are some possible side effects. Some children could feel minor discomfort. There could be some soreness or a mild rash on the skin where the shot was given. Others might get a slight fever. However, these mild effects are normal and should not cause alarm. Some parents are concerned that vaccines might cause autism. However,many studies show that there is no link between getting vaccines and then getting autism. As with any medicine, there is a very small risk that problems could occur. But the possible harm from vaccines is very small. The possible harm from infection is much greater. Talk with a healthcare professional about any questions or concerns you may have. What vaccines should my child have? Your child needs the same vaccines as those given to children without kidney disease. Some vaccines may need to be given in a different dosage to make sure your child is protected. 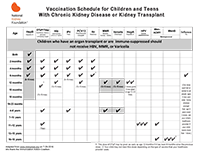 A extra vaccination, Pneumovax, is often recommended for children with kidney disease. All children over the age of six months, including those with kidney disease, should also receive the flu vaccine every year. If your child is waiting for a transplant, they should receive all the vaccines that their doctor recommends. If they do not have all of their vaccines, then they will not be able to get a transplant. If your child has an organ transplant or is immune suppressed currently, it is important not to use vaccines made from live viruses. Live virus vaccines are given to prevent measles, mumps, rubella, varicella and oral polio. Your doctor is the best person to ask about which vaccines your child should get. How often does my child need a vaccination? Depending on the vaccine, your child may need only one shot. Other vaccines may require a series of shots to be given at standard times. However, if your child is sick when the next shot should be given, it is best to wait until he or she is well again. The shot should then be given as close as possible to the regular schedule. What about vaccines for the other children in my household? Talk with your doctor before giving varicella zoster (chickenpox) to other family members since this vaccine is made from live viruses. It is safe, however, for other children in the house to receive measles, mumps, and rubella vaccine. What should I do if my child is in daycare with other children who may have received live vaccines? You should talk with your daycare provider about your child's medical condition. If your child has received an organ transplant, you should talk with your doctor about contact wtih children who have had oral polio vaccine or other live vaccines. Your child can get vaccines from your healthcare professional. You may also be able to get them from your local public health department at no cost or at a lower cost.. Check to see if the cost of routine vaccines is covered by your health insurance company. How do I know when my child should receive his or her vaccines? The following table is a schedule of the most common vaccines used today in the United States. Other vaccines might be needed if you are traveling to a foreign country with your child. Speak with your healthcare professional about these vaccines. ***Children who are waiting for a transplant should get all vaccinations that are recommended by their doctor.